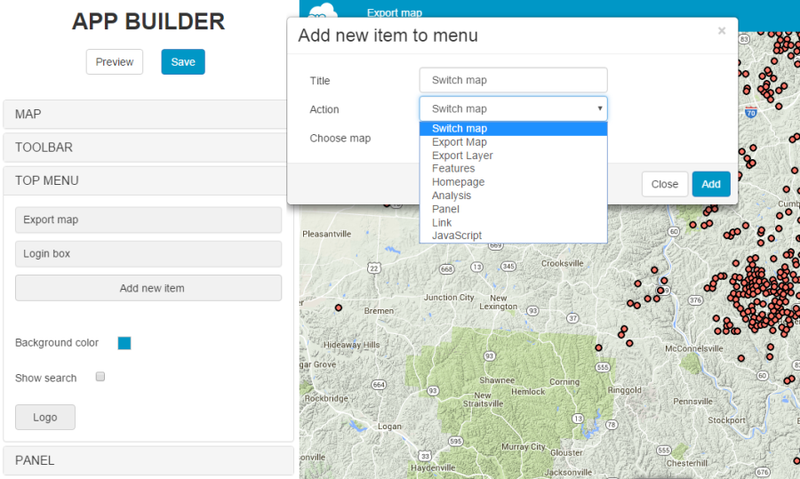 With App builder you can customize your custom app (Map Portal) according to your needs. You can create user friendly user interface by yourself, without programming knowledge. It is possible to add your personal logo, custom color, tools, buttons, panels and many more. Login with your GIS Cloud credentials. App builder interface will open from the left side. Preview button is used to review changes made on custom app before they are published to other users or public. Changes will be saved after Save button is hit. Select default map from the drop down menu. This map will open by default when app is refreshed. Click Preview to see changes and Save to save changes. Select tools that will appear on the custom app. In the top menu it is possible to add buttons, set background color, hide and show search (magnifying glass) and set your custom logo. Check Search box to show Search from the Top Menu (magnifying glass). You can upload and add your custom logo. It should be 60*43 pixels in size, but it can be larger too. In panels you can add advanced filters, open static text or open another web page within a panel. Note: Please be aware of http/https protocol, if your app is open with https, then your url must use the same protocol! If you have text file stored in your File Manager, you can display it on a panel. 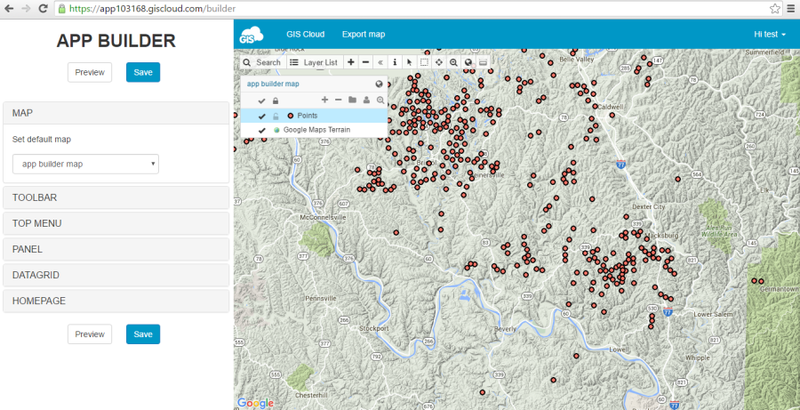 Filters are used for extracting data both in the data grid and map view. Check or uncheck box to show or hide data grid on the bottom of the page. Hit Preview&Save. Check Show homepage box to show homepage. Select Default, All, My and/or Shared maps, hit Preview&Save. After all changes are made, from the app URL delete /builder.